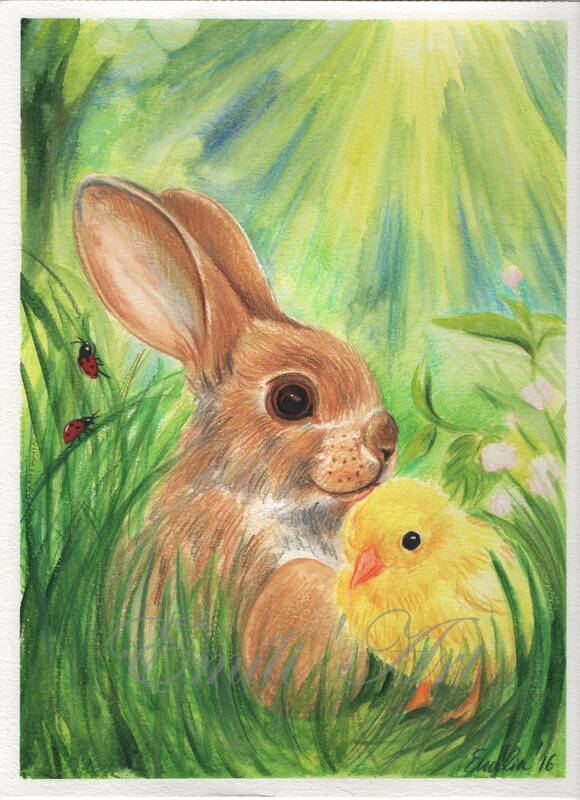 I made this illustration for celebrating Easter. Inspired by the little bunnies running everywhere in the irish fileds. I used all the symbols as we express the fertility from the ancient times. ...Eostre reached into the folds of her gown, and from it pulled a crown of red clover blossoms which she placed upon the hares head, and appointed him a special place by her side, extending to him an invitation that he may live with her, where he will never again know hunger, if he were to paint eggs for all the children of the world to enjoy. The hare, seeing the joy his egg had brought to the Goddess, and the wonder which filled the faces of the children, graciously accepted Eostre’s invitation. From that day forth, the hare was always present by Eostre’s side, never new hunger, and on the eve of Ostara delivered eggs to all the children to enjoy as a reminder of spring, and Eostre’s love.